Michael Freund driving Wendy O’Brien’s Pony Pair. Photo: Vicki Long. Windsor, SC – March 6, 2013 – For the third year in a row, the Salute to Driving weekend, held in Windsor, SC, March 1-3, 2013, featured a beautiful dinner and auction, multiple driving clinics and a Combined Test Competition, all for the benefit of the United States Equestrian Team Foundation and the United States Equestrian Federation’s High Performance Driving program. A highlight of the weekend was the successful Saturday night dinner and auction, which was held at organizing committee member Bev Lesher’s Courage to Lead Farm. The evening event was put on to raise funds for the USET Foundation that will be specifically dedicated to helping train the best drivers and equines to represent the USA in World Driving Championships. During the decadent Berry Catering dinner, organized by Wendy O’Brien, attendees bid on fabulous live auction pieces. Auctioneer Paul Martin donated his time to handle the Live Auction of six special items. A sampling included a week at Hilton Head SC in a top resort condo for four including free greens fees, a dinner for 6 in Aiken in Jack Wetzel’s restored Log Cabin, three nights for two (including breakfast) in Boston at the prestigious Union House, Stabling and a B&B for two nights in Maine at the wonderful Acadia National Park in Maine, and a week’s stay in a 4 bedroom home on Block Island in Rhode Island. In addition to the Live Auction, a Silent Auction ran at the event from Friday morning through Saturday night and came to a close following the dinner. Prior to the benefit dinner and auction, the weekend long Salute to Driving kicked off with dressage clinics by Michael Freund and Sterling Graburn at Chateau Log and Courage to Lead Farms. Freud led the USEF long listed drivers through the clinic, while Graburn worked with developing drivers. Other special events included a hazard demonstration and clinic, harnessing demonstrations, farrier demonstrations and a carriage exhibit. All of the weekend events served to help raise awareness and educate different audiences about the discipline of driving. The weekend concluded on Sunday with the Combined Test Competition. Drivers at the preliminary through advanced levels had the opportunity to showcase their skills in both dressage and cones. 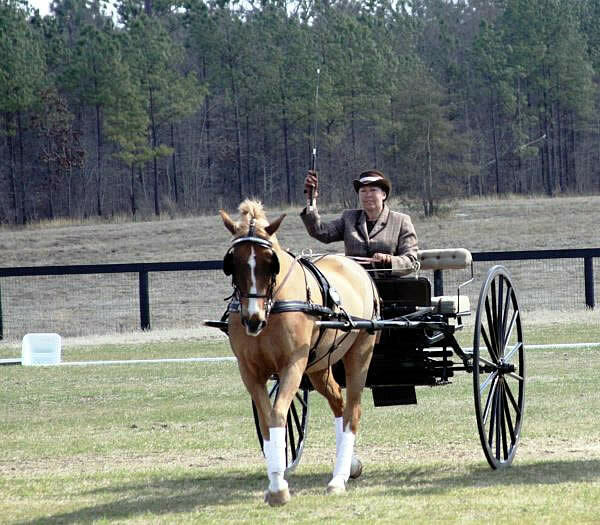 For the first time since its inception three years ago, the Salute to Driving also welcomed ‘Very Small Equines’ (VSEs) in the combined test. 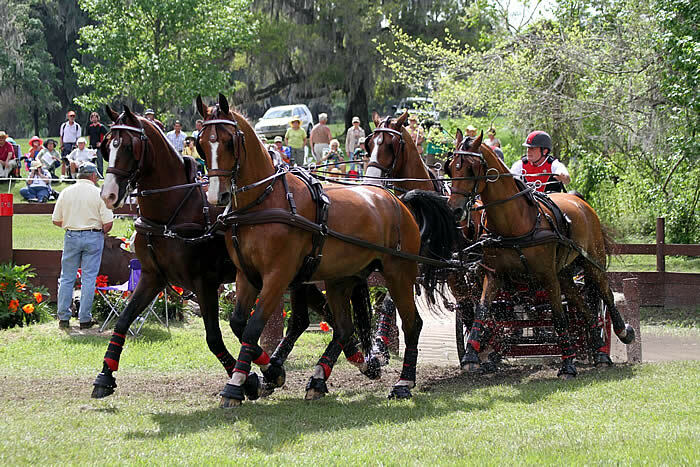 The VSEs were also showcased doing a quadrille driving performance organized by Janelle Marshall. To the tune of “Flight of the Bumblebees,” eight drivers decked out in yellow and black bumblebee style put their VSEs through their paces and got huge appreciation from the crowd. For more information about the Salute to Driving, please visit http://salutetodriving.com/. Ocala, FL (February 22, 2012) – Decorated combined driver Chester Weber will donate a package for Two Days of Training at the United States Equestrian Team’s “Salute to Driving” Fundraiser. The benefit is designed to raise funds for the discipline of driving, and Weber invites the winner to bring their own horses to enjoy two days of training at his prestigious Ocala training facility, Live Oak Stud. The Third Annual Salute to Driving fundraising event will take place March 1-3 in Windsor, South Carolina. 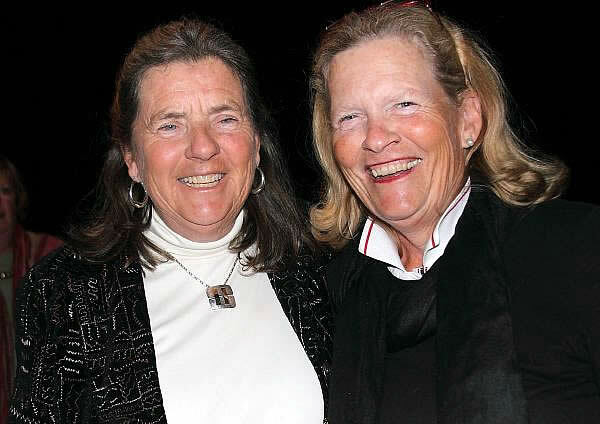 Each year, the event has raised money for the country’s High Performance Driving programs for the United States Equestrian Team Foundation. The weekend will feature a beautiful dinner and auction on Saturday evening, multiple driving clinics with some of the world’s top trainers, and a combined driving competition for Preliminary to Advanced level drivers on Sunday. 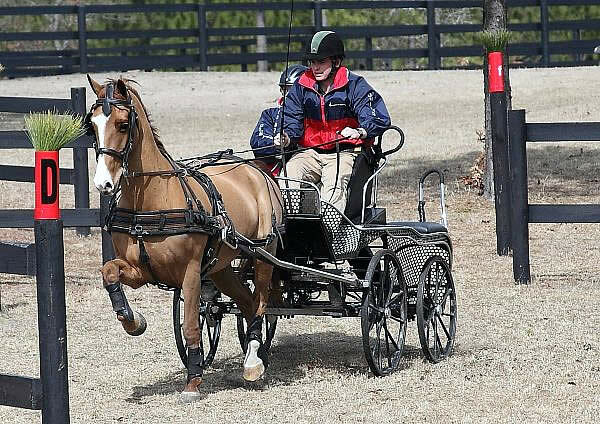 Also included in the weekend are dressage clinics with Michael Freund and Sterling Graburn, harnessing demonstrations, carriage exhibits, a Driving Blind Cones activity with golf carts, and a mini-quadrille. The Salute to Driving fundraiser will be hosted by Chateau Log and Courage to Lead Farms in South Carolina. “I am really looking forward to once again supporting the Salute to Driving weekend. Last year I donated two days of training, and it was very well received. I believe the USET is a very worthy cause and the money raised during this weekend will go toward sending the US driving athletes to international competitions,” Weber said. Weber is known for his prowess in the discipline of combined driving, and has many wins and accolades to his name. He and his team of KWPN geldings took Individual Silver and helped propel the US team to a Bronze medal at the 2012 World Driving Championships in Riesenbeck, Germany. Known for his trademark record-breaking scores in the dressage phase, Weber was dubbed “Mr. Dressage” by the foreign media when he competed overseas during the summers of 2011 and 2012; he recently scored a 37.94 in the dressage at the 2013 CAI Little Everglades and set a new World Record with FEI Test 11. Weber also has many international wins under his belt and has won the USEF National Four-in-Hand Combined Driving Championship a record 9 times. For more information on Weber and his combined driving team, visit their website at www.chesterweber.com. For more information on the Salute to Driving weekend, contact Beverly Lesher at 717 554 1241 or nanabrl@aol.com. Johnny Robb – JRPR, Inc.
Aiken, SC (March 9, 2012) – For the second year in a row Chester Weber, the eight-time USEF National Four-In-Hand Combined Driving National Champion, donated lessons to the “Salute to Driving” Benefit to support the USET Foundation. The fundraiser featured a dinner and live auction, as well as clinics, held over three days at Wendy O’Brien’s Trout Walk Farm in Aiken, South Carolina. Aiken, SC – February 22, 2012 – For the second year in a row, the ‘Salute to Driving’ weekend benefit hosted a beautiful Dinner & Live Auction on Saturday, February 18, 2012, for the benefit of the United States Equestrian Team Foundation to help support the USEF High Performance Combined Driving. The successful evening was held at Wendy O’Brien’s beautiful Trout Walk Farm in Aiken, SC. The event was held to help raise funds for the USET Foundation that will be dedicated to helping train the best drivers and equines to represent the USA in World Driving Championships with the goal to bring home Team and Individual Medals. The dinner began at 6:30 pm, and during the evening’s Live Auction, attendees bid on auction items which included lessons with top driver Michael Freund in Florida, lessons with Chester Weber during the Live Oak Driving Event 2012, a dinner for six presented by Jack Wetzel at his newly restored 1780s log cabin in Aiken, a week-long vacation in a four bedroom Victorian home on Block Island in Rhode Island, a Picnic Supper for 20 people at Wendy O’Brien’s Trout Walk Farm hosted by the Bronze medal winning team from the Pony World Driving Championships, and a Ride on a Coach with the Four-in-Hand Club with lunch in the Audubon Nature Preserve. In addition to the live auction, a silent auction featuring 30 quality items was held throughout the day on Saturday, and came to close following the dinner. The "Salute to Driving" will take place February 18-20, 2012. Photo By: Vicki Long. Aiken, SC – January 4, 2012 – The Second Annual Salute to Driving fundraising event is pleased to announce that it will once again be held in Aiken, and Windsor SC, February 18-20, 2012, and will feature many exciting new additions. Last year’s debut event benefited this country’s High Performance Driving programs for the United States Equestrian Team Foundation, raising over $30,000. The exciting weekend event will feature a beautiful dinner and auction on Saturday evening, multiple driving clinics with some of the world’s top trainers, and a Combined Test Competition for any drivers Preliminary-Advanced on Monday. The Salute to Driving event is being held to help raise awareness and educate different audiences about the discipline of driving. Salute to Driving will kick off its festivities on Saturday, February 18, 2012, with dressage clinics by Tjreed Velstra of The Netherlands and Hardy Zantke of California at Chateau Log and Courage to Lead Farms. Auditing these clinics is free, and Velstra will lead the USEF long listed drivers while Zantke teaches the developing drivers. Other special events include a hazard demonstration and clinic, harnessing demonstrations, and a carriage exhibit. Bev Lesher, Lisa Singer, and Wendy O'Brien at the Salute to Driving. Photo By: Vicki Long. Aiken, SC – February 25, 2011 – The first annual ‘Salute to Driving’ event hosted a beautiful Dinner & Live Auction on Saturday, February 19, 2011, to benefit the United States Equestrian Team Foundation and, ultimately, USEF High Performance Combined Driving. The successful evening was held at Wendy O’Brien’s Trout Walk Farm in Aiken, SC. The goal of the event was to help raise funds for the USET Foundation that will be dedicated to helping fund and train the best drivers and equines to represent the USA in World Driving Championships to bring home Team and Individual Medals. The dinner began at 6:30 pm, and during the evening’s Live Auction attendees helped raise funds for the USET Foundation. Auction items included two lessons with top driver Michael Freund at Little Everglades or Live Oak 2011, two lessons with Chester Weber during Live Oak 2011, a dinner for eight presented by Jack Wetzel at his new log cabin in Aiken, a week long vacation in a large Victorian home on the beach in Cape May, NJ, a week long vacation in Block Island, RI, a print, “Patriots Barn” by Jamie Wyeth, signed and remarqued by the artist and brunch for four at the Green Boundary Club. There were also over 20 raffle items given away through the night that ranged from a professional photo shoot to dancing lessons.